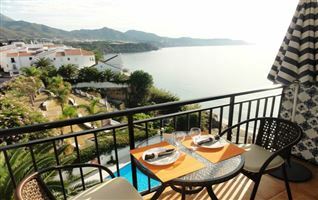 AVAILABILITY AUGUST 24 - SEPTEMBER 12 @ Weekly €620 / Nightly €89 during August and Weekly €520 / Nightly €75 after September 9. 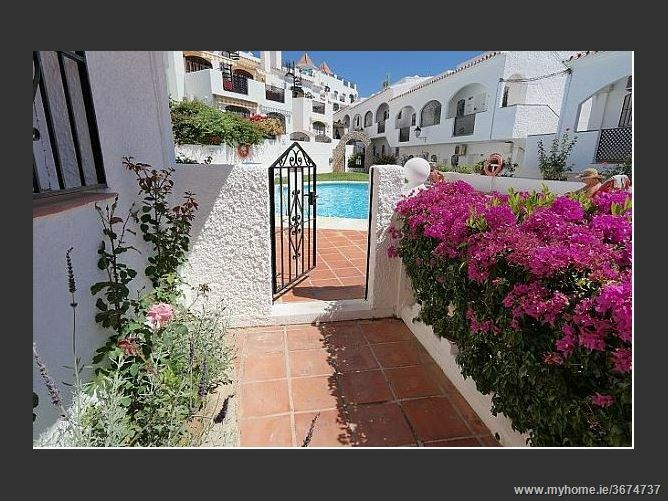 Charming 2 bedroom (Occupancy 4 people) ground floor apartment accessed by approximately 10 steps with a private courtyard and easy access to a communal pool and garden is located in the well known centrally located development of Verano Azul. 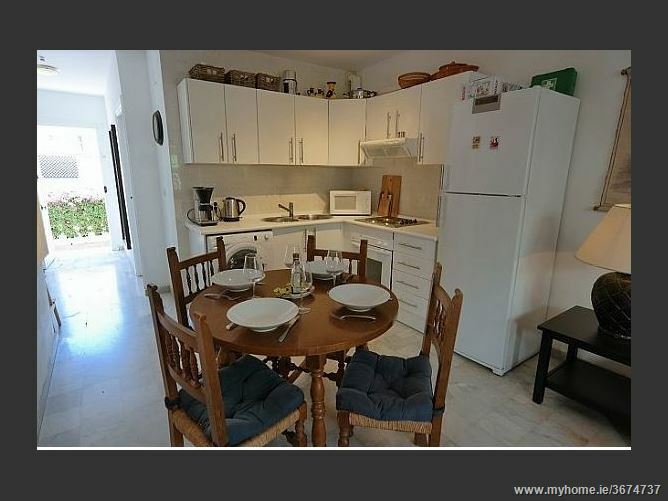 Furnishings are comfortable and the property is well equipped. WIFI is included in the rental price. 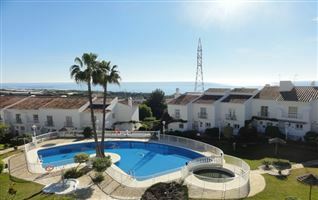 This property is built on one level, on the footstep of the communal pool and garden. 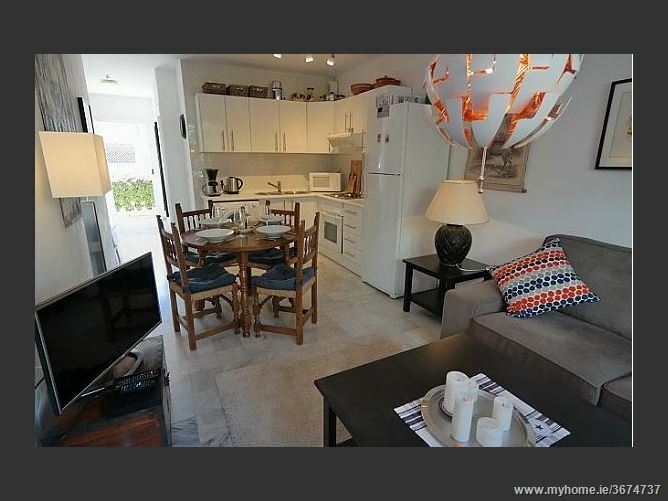 The lounge with an open plan design, dining area and fully equipped kitchen. 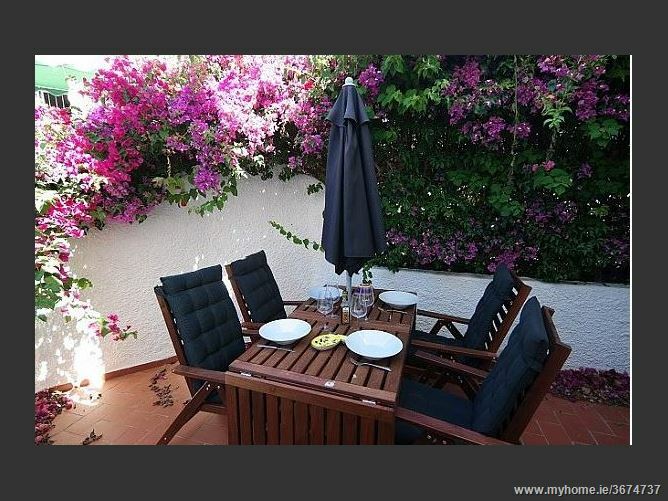 Courtyard fully enclosed with garden table and chairs and one sun lounger. 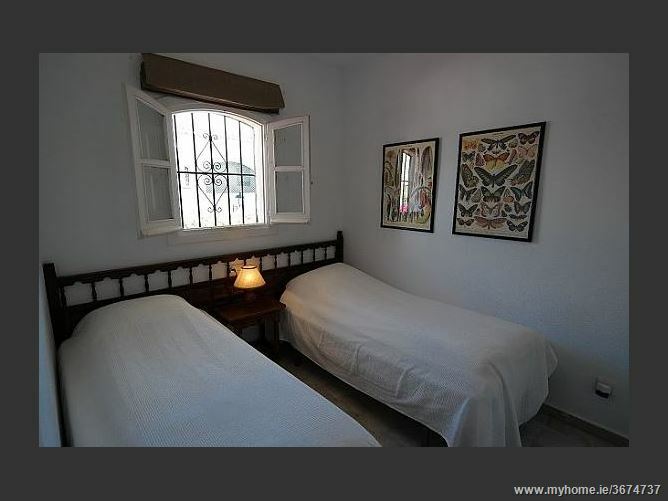 Two bedrooms, one double and one twin bedroom as well as a family bathroom ensure you have a comfortable stay in the property. Cot and highchair available upon request. Linen for cot not included. WIFI is included in the rental price. Partly air conditioned. 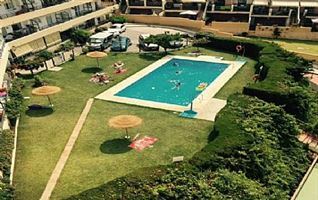 Large communal pool and garden. 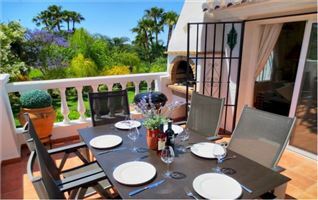 Private fully enclosed courtyard with large wooden garden table and four chairs and parasol and sun lounger. 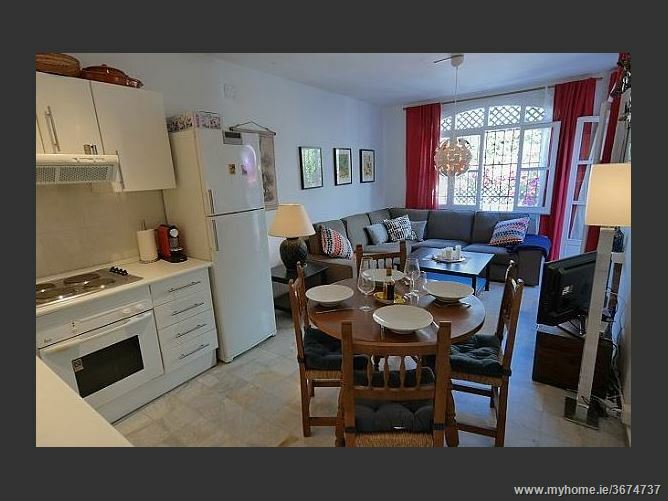 Large sofa, low level coffee table, side table with free standing lamp, side board with flat screen TV (channels listed below *) and DVD player, round dining table and four chairs, doors to private court yard. 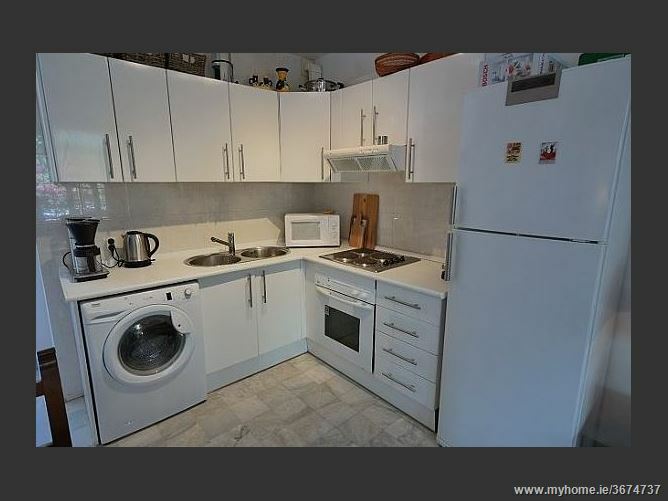 Fully equipped and open plan, with electric oven and hob, large fridge freezer, washing machine, coffee makers, kettle, toaster, microwave, extractor fan. 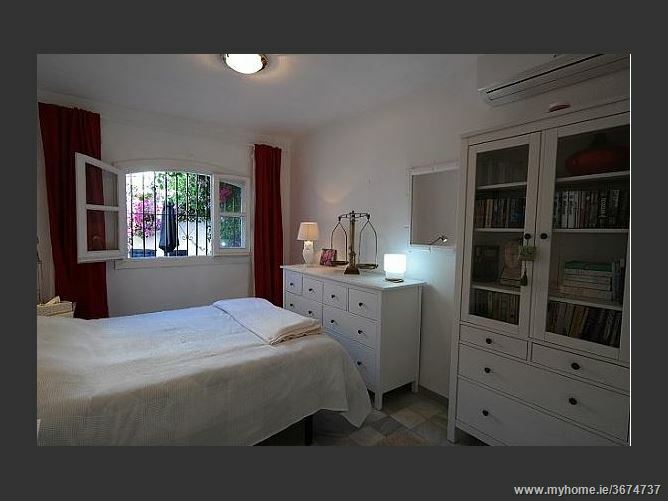 Double bed with side tables and reading lights, chest of drawers, wall mounted mirror, large cupboard with draws, build in wardrobe, air conditioning unit. Twin beds with bedside table and reading light, built in wardrobe. 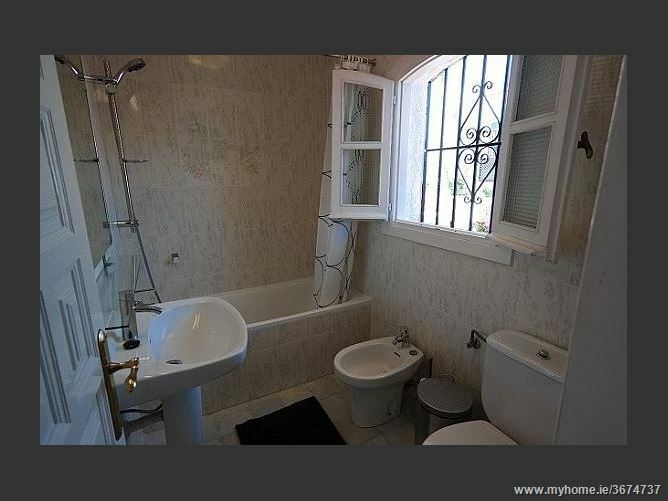 Full length bath with overhead shower and shower screen, (cannot be used as bath as there is no tap to the bath, only the shower) bidet, freestanding sink, wall mounted mirror and WC.